He holds his job well. Prince was purchased in the spring of 1903 and has worked continuously for ‘Uncle Sam' ever since. No photographer was noted in this photo from Bureau of Reclamation files. We believe that Prince worked as a left wheel horse hitched as a team of two. 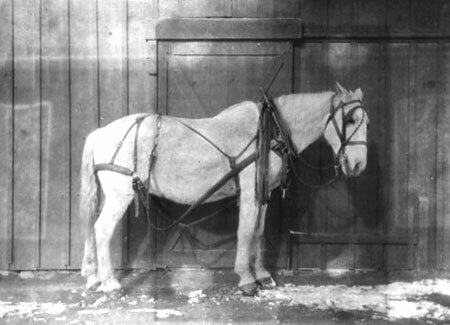 The harness indicates he would most likely be hitched to a small freight or light-duty ore wagon. For many years, the Bureau of Reclamation submitted an annual project history for every authorized project in the Pacific Northwest Region. These historical documents contain valuable information about the investigation, development, authorization, construction, and operation and maintenance of projects during the early years of the last century. Unfortunately, the Boise Project history does not contain information about the number of horses owned by or working for Reclamation. The 1912 Project History does note in the list of personnel that there was a stable boss and two blacksmiths. Long before the advent of bulldozers and earth-moving tractors, the Bureau of Reclamation was directed by Congress to construct dams and canals. Using the tools of the day, Reclamation staff constructed five projects in the Pacific Northwest in the years from 1902 to 1916. Although project histories contain an enormous amount of detail concerning the equipment, construction materials, and construction of dams, canals, ditches, and laterals, there is little information concerning teams of horses. Today Reclamation employs approximately 1,100 hydrologists, engineers, biologists, recreation planners, and administrative and management support staff, and others in the Pacific Northwest Region. Currently there are no horses on the payroll.